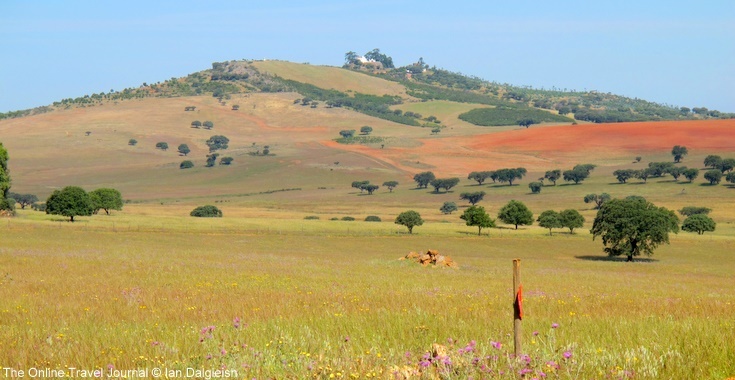 While staying at the idyllic, lakeside Quinta Do Barranco da Estrada in southern Portugal we went for a day’s birding with owner and guide Frank McClintock on the plains of the Alentejo. The mist is still hanging low over the lake as we climb into Frank’s 4 wheel drive and head off along the dirt track to connect with the tarmac at the ‘top of the world’. Frank obviously knows the dips and bends well driving confidently into the swirling, white vapour. We have a little way to go to the plains of the Alentejo so I settle back to enjoy the ride along empty roads. Beside one stretch there’s a double line of telegraph poles, new ones designed to prevent storks building nests on top next to old with a stork in residence on nearly every pole. White Storks are a protected species in Portugal, Frank explains, and the nests – big untidy looking affairs of twigs – are reused and added to each year, hence this dual arrangement. Gradually as we go east greener semi-forested landscape opens out into fields and grassland; the mist is beginning to burn off promising a hot day. We skirt the town of Ourique – it’s mooted that the battle in 1139 in which the Moors were defeated and Portugal came into being as a Kingdom was around here – and a bit further on make a timely stop at a cafe for a tall glass of milky coffee to perk us up after the early start. Now the birding starts in earnest with windows down and eyes peeled. The first stop is at a pond in a field; three Red-knobbed Coots, not usually seen in this part of the world, have been sighted, a couple in a pond elsewhere and one for some reason on its own here. Frank pulls off onto the verge and we make our way across a dew laden field to the artificial pond, cautiously clambering up the raised banks to peer over the top across the reeds. The coot is there amongst its Eurasian relatives just made out from the flashes of red on its head. While Ian and I adjust binoculars and get focused Frank circles the pond and manages to get a photo. Turning homeward in the afternoon we stop at the castle crowned town of Mértola, perched above the Guardiana River. Lesser Kestrels nest here, while we’re scanning the roof tops and walls of the town for them from across the river an Azure-winged Magpie sets down on a rock nearby – Frank’s pleased to get a shot, commenting that he often sees flocks of these attractive birds around the Quinta but they’re skittish in that environment and don’t hang around. There are a few more spots to check but in the heat of the day the birds are staying closer to the ground. “Not too tired?”, asks Frank at one point. Far from it – I don’t want the day to end. Frank offers Birding Holiday Packages based at his lakeside Quinta in Southern Portugal – it’s unique and very peaceful. Packages come with full or half board options plus a variable number of full day outings by 4×4 covering 3-400 kms. Itineraries can be flexible to suit your budget and requirements so it is best to Send Frank an Email with dates and wishes. It looks like fun – must try it sometime. It seems birdwatching is becoming more popular in Portugal these days. This is a great news that Bird watching is becoming popular there and in other parts of the world, through which we hope that birds can be protected and conserved…can not imagine the sky without birds.